Moon Tool & Die of Meadville, Pa., is known for handling machining projects that others may not want to touch. The company enjoys taking on challenging new jobs that push its capabilities, and it considers itself to be an extension of its customer’s production operation. Over the years, the markets that Moon Tool & Die serves have grown into energy, electronics, consumer products and mold/die repair. And today, half of the company’s revenue comes from production parts, rather than just die and mold work— its previous concentration. Diverse customer needs led the company to obtain flexible machines that could handle most anything, like when a job came up that required thousands of small holes. 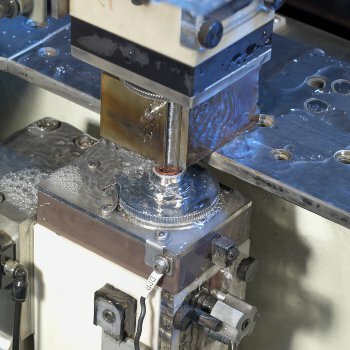 The variety of flexible machines enables Moon Tool & Die to create products using the best processes available—whether doing milling, Ram or wire EDM—and to do so while achieving demanding accuracies. Moon Tool & Die can machine in graphite, steel, bronze, aluminum, copper, titanium and tool steels—all with high precision. The machines can handle parts well on their own, or perfectly together—helping to fulfill each customer’s individual needs. The SP43 wire EDM machine cuts 20 percent faster in a single pass than any of the other wire EDM machines that Moon Tool & Die had used in the past. The company is now 15 percent faster overall when producing a finished part while using about half as much wire. In addition, after five years of near-continuous operation, the company hasn’t had to replace a wire guide yet. Because they are self-cleaning, maintenance takes only five minutes per week. The intuitive touch-screen controller has also made operating the machine very easy. The Makino U32j enables Moon Tool & Die to continuously thread 2,500 holes on one particular job, each 0.02177 inches by 0.0397 inches, with only 0.0395 inches spacing equally across the X- and Y-axis. Even while frequently running unattended, the U32j cut the part perfectly. It has quickly become Moon Tool & Die’s go-to machine for high tolerances and smooth surface finishes that don’t require benchwork. The S56 provides the ability to machine graphite to feed the EDGE2S, while allowing the company to hard mill up to 65 HRc that had previously required EDM processing. The EDGE2S is used to produce cavity blocks, molds and production parts with square corners and other features that demand the accuracies of a sinker EDM. The machine’s tool changer provides the company with unattended machining capabilities for night and weekend operation.